Last year Matt Kuchar got the biggest win of his career, when he claimed the 2012 Players Championship, the flagship event on the PGA Tour. Often considered the ‘fifth major’ even though not official, the win certainly vaulted Kuchar into the category of best players without a Major championship. Kuchar was unable to produce a Major championship win after the victory at TPC Sawgrass, but came into 2013 still with confidence, and certainly lay more claim to the ‘best without’ category. This past week, Kuchar’s win at the 2013 Accenture Match Play might just rival his performance at the Players Championship last season. 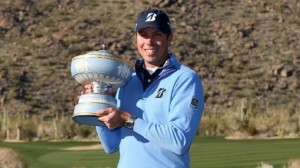 Kuchar defeated defending champion Hunter Mahan 2 & 1 on Sunday afternoon at Dove Mountain in Marana, Arizona for his first World Golf Championships victory. And like the win last year at the Players, the win at the Accenture comes at a great time, with the Masters less than two months away. Kuchar is certainly a trendy pick now, as the PGA Tour moves from the West-Coast down to the southeast of the U.S. for the Florida-Swing. It starts with the Honda Classic, with other events on the schedule such as the Arnold Palmer Invitational and the WGC Cadillac Championship at TPC Blue Monster. What is surprising though is that Kuchar’s odds to win the 2013 Masters didn’t move much, even after the win at the Accenture Match Play. Kuchar went from 40/1 to 33/1 so there was definitely some movement, but he is still not a top-10 favorite. And it’s not like Kuchar has not had success at the Masters either. He finished third last year at Augusta National, and held the lead on the weekend at various points. As of now, a 33/1 payout looks pretty solid to take a chance on Kuchar. You can bet if he keeps playing well he will jump up more on the betting odds. The names in front of Kuchar are certainly impressive, but on the whole Kuchar has won two huge tournaments in less than 12 months, and the only thing left to do is to etch his name on that exclusive list that is a ‘Major champion’. This entry was posted in News and tagged 2013 masters, accenture match play, betting odds, hunter mahan, matt kuchar, the players championship on February 25, 2013 by Bryan.